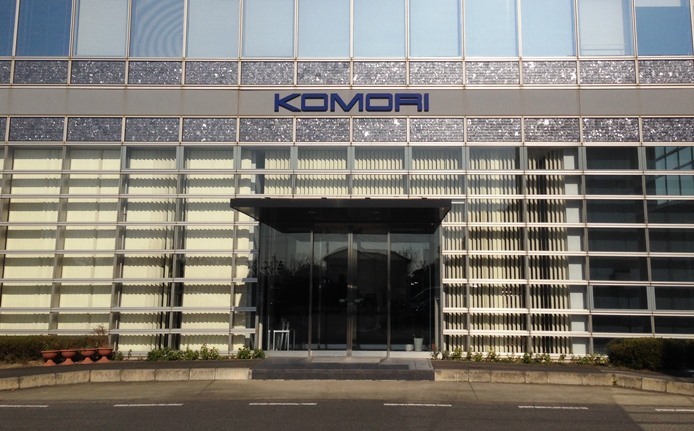 We were in Japan last month, and as luck would have it, we were there at the same time that Komori held an open house to showcase its newest digital print solutions. This international event took place at Komori’s facility in Tsukuba, Japan, and drew hundreds of attendees from all over the Asia Pacific region. It provided the opportunity to showcase Komori’s Impremia IS29, a B2-format, sheetfed, UV inkjet printer capable of speeds up to 3,000 simplex sheets per hour. Also on display were a six-unit, 18,000 sheet per hour, B1-format Komori Lithrone GX40RP H-UV offset press running UV inks and a Komori Apressia DC105 diecutter. Komori’s recently announced sales partnership with Highcon was clear to see through the demonstration of the Euclid II+ during the open house. Horizon, also a Komori partner, showed a saddle stitcher. The theme running across all of the products shown was a demonstration of a hybrid workflow for test marketing a national campaign for a cosmetic product. Using a combination of offset and digital print provides the opportunity to produce short, medium, and long runs of the required packaging and promotional materials in multiple versions. Trial production begins with using Komori’s Impremia C100 and a Mimaki CF-2 cutting plotter to handle the small lots needed for an internal design competition. The next step is test marketing limited runs of personalized pieces using the IS29 for printing and Highcon’s Euclid II+ for laser diecutting and creasing. For the national launch, high volumes would be produced using the Lithrone GX40RP, the Apressia DC105 diecutter, plus some additional finishing for folding and gluing. A great part of this demonstration was the ability to make a side-by-side comparison between offset and digital print output on the same paper. Such a demonstration puts color management tools to the test. 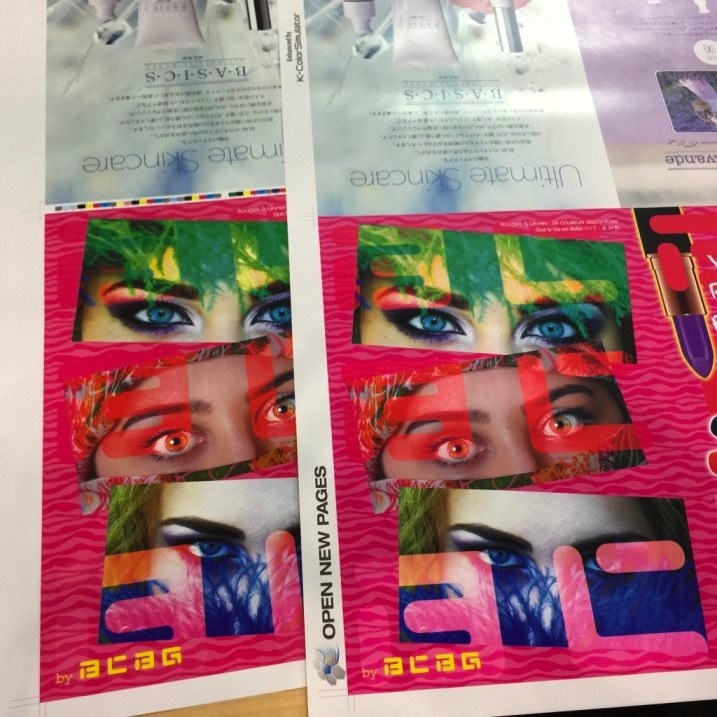 Komori used its K-ColorSimulator 2 color management software to adjust for the differences in the various output technologies (toner, UV inkjet, and offset). It is interesting to note that the color gamut of the IS29’s UV inks actually exceed offset inks across most parts of the spectrum. That presents an additional challenge for color management. For buyers who want to follow the path laid out by Komori, creating prototypes on digital devices with final production on offset presses, there are some things to be prepared for. We noticed that the color matching was quite good, but there are still noticeable differences in terms of reflectivity and texture. For most brand managers, the ability to do high-quality prototyping and testing is so significant that the differences would not be important. Their color management solutions are tuned to their process providing a good path to acceptable outcomes. For jobs intended to reside only on the Impremia IS29, Komori showed solutions that included their variable data print tool, Magic, producing PDF-VT files that personalized posters and marketing collateral. It was interesting also to see UV technologies at play in both the digital and offset methods. The offset UV inks used by the Lithrone GX40RP H-UV are called LE-UV (low energy UV). This was described as a ‘high sensitivity’ UV ink that doesn’t need as much energy to cure. Komori reported that 650 units of their presses were using H-UV (about half of their installed base). Fast drying is the hallmark of UV offset inks. The UV inks of the Impremia IS29 also have advantages in drying, as well as allowing a broader substrate range than water-based inkjet. This is particularly important for coated stocks, which present a challenge to production color inkjet products using offset inks (systems typically offer pre-treatments to address this). One other difference between the UV inkjet of the IS29 and offset output was ink layer thickness. Offset inks are virtually flat and there is very little texture created as a result of the print. UV ink layers are not nearly as thin and the texture of the UV inks on the IS29 output could be noticed, particularly in heavy coverage and text areas. 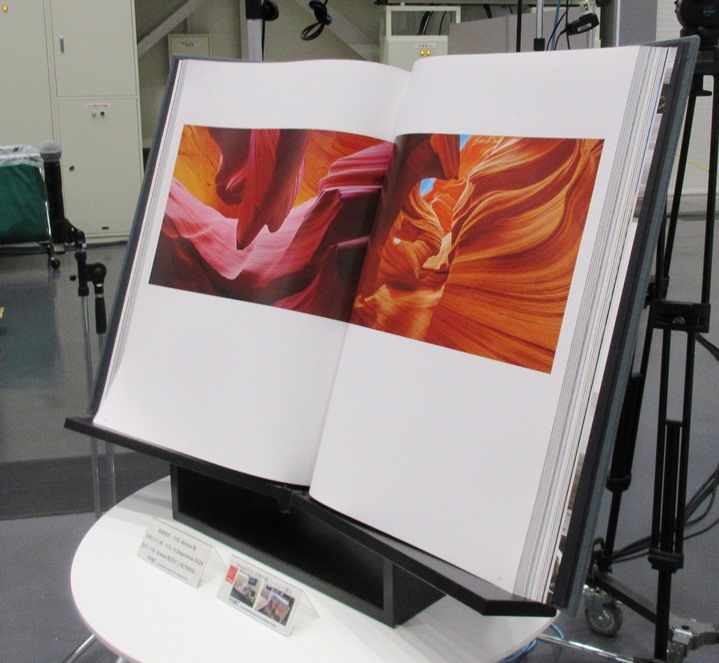 An impressive large-format book was on display at the open house. This piece was produced by a Chinese book printer called Artron, which has the first Impremia IS29 in China. Komori’s digital print partnerships include Konica Minolta and Landa. Komori’s partnership with Konica Minolta is exemplified not only by the Impremia IS29 (which Konica Minolta sells as the AccurioJet KM-1) but also the Impremia C100 (Konica Minolta’s bizhub PRESS C1100). Not visible at this event, but evident at drupa was Komori’s partnership with Landa. Komori’s Impremia NS40 is based on the Landa S10. The S10 combines a Komori chassis and transport system with Landa’s Nanographic imaging system. Like the Landa systems, the NS40 will be available in four- and seven-color configurations as well as simplex and duplex systems. Shipments of the NS40/S10 are expected to begin in 2017. One of the first beta customers of the NS40 will be Cassachrome in Belgium, a specialist in fine art and book printing that has been using Komori offset presses for many years. According to Komori, full availability of the NS40 will begin in the spring of 2018 after the completion of the beta-test phase with Landa. Komori’s partnership with Highcon is also deepening. The companies recently signed a strategic partnership in the Americas. Of course, the presence of The Highcon Euclid II+ at the open house in Japan indicates that the partnership goes well beyond the Americas. 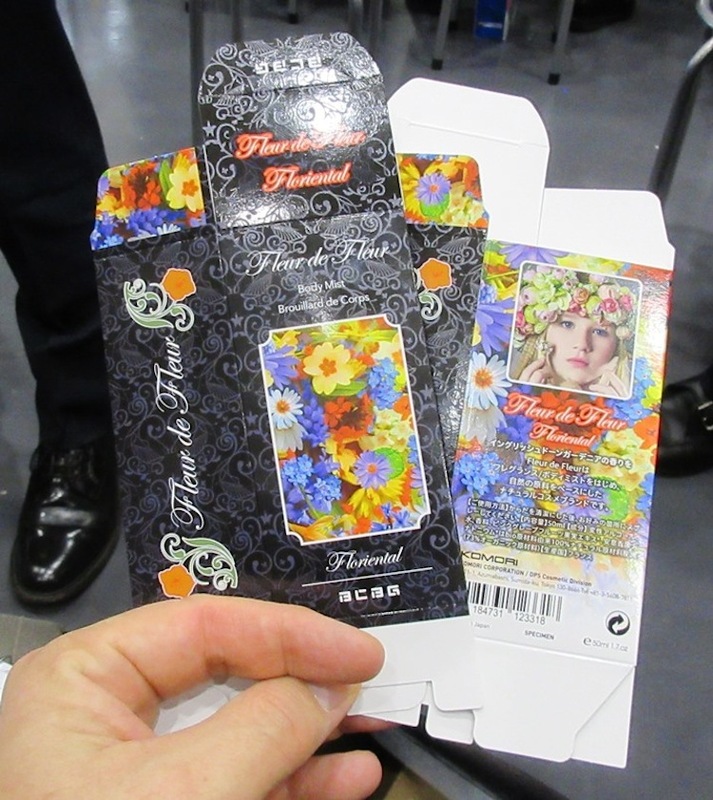 As usual, Highcon’s selection of output samples were impressive, and well suited to the cosmetic packaging demonstration. All in all this was an amazing event and we were happy that the timing on this worked out for us. (We were both in Japan for the annual POD Japan client event. *) With about 500 people in attendance over the two days of the open house (including a large portion from outside Japan), this was a significant event that speaks to Komori’s heritage in offset print, its partnerships in digital print, and its overall impact in the printing industry.